Spam and phish messages appear daily in my email. When I receive the latter, I dutifully forward them as attachments to the IRS, Wachovia Bank, Paypal or whatever organization the online crooks are trying to impersonate. As I do so, I fantasize about ejecting the offending thieves out the nearest airlock. But here is an interesting twist to the Nigerian “419” scams: Send money to help a stranded Nigerian cosmonaut! Kindly expedite action as we are behind schedule to enable us include downpayment in this financial quarter. Please acknowledge the receipt of this message via my direct number 234 (0) 9-234-XXXX only. So now even the cosmos is employed to dupe the mentally-challenged out of their money. 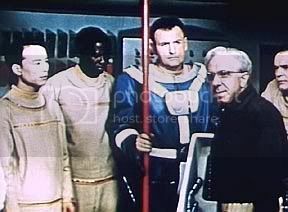 After all, everyone should know that the first African cosmonaut was Communications Officer Talua (actor Julius Ongewe) from Der Schweigende Stern (The Silent Star), better known in the West as The First Spaceship On Venus! On that tragic mission, Talua and American astronaut Robert Brinkman (actor Günther Simon) perished when they were unable to return to the Kosmostrator spaceship as it was hurled into space by the uncontrolled Venusian energy-mass converter technology. And, I should mention, that for the first time the complete, original version of Der Schweigende Stern is available for purchase, in Region 1 NTSC format, both as a single DVD and as part of the impressive DEFA Sci-Fi Collection three-DVD set. [img2=right]http://i81.photobucket.com/albums/j219/Kosmosflot/Poster/Omega06.jpg[/img2]This East German/Polish production was probably the first Eastern Bloc film that I ever saw, and it’s well-remembered by science-fiction fans for its beautiful rocketship, The Kosmostrator, and the eerie depiction of the surface of Venus. And there was the cute little chess-playing, tank-like robot, Omega, which for whatever reason was dubbed as “Oh-me-GAH”. The First Spaceship On Venus was often shown on Indiana’s WTTV Channel 4 during the mid-60s. The first time I saw it, I was shocked when the American astronaut arrives at the cosmodrome in a MIG-15 jet! What?!? I’ve not yet seen the original film, but apparently in it the U.S. refuses to support the mission to Venus, and the American crew candidates actually defect in order to participate! I hope to confirm this amazing Cold War plot twist with a future viewing of the DEFA DVD. It is certainly edited out of the dubbed version. So, don’t send any money to Nigeria to save some poor African cosmonaut. Save your kopeks to rent or buy The First Spaceship On Venus or the DEFA Sci-Fi Collection instead!